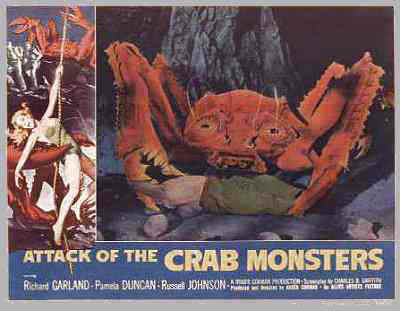 Today’s flick is Roger Corman’s famous creature feature b-movie, Attack of the Crab Monsters. Attack of the Crab Monsters was written and co-produced by Charles Griffith, a frequent Corman collaborator who penned such memorable flicks as Death Race 2000, A Bucket of Blood, and The Little Shop of Horrors. The director and producer of Attack of The Crab Monsters was, of course, Roger Corman, who is widely known as the king of the b-movies. Though he has primarily worked as a producer over the years, he also has over 50 directing credits, including The Wild Angels, The Creature From The Haunted Sea, A Bucket of Blood, and The Little Shop of Horrors. The cinematographer for Attack of the Crab Monsters was Floyd Crosby, who also shot movies like House of Usher, The Raven, and X: The Man With X-Ray Eyes for Roger Corman. The editor for the film was Charles Gross, who cut a handful of other b-movies like Invasion of the Saucer Men and It Conquered The World. 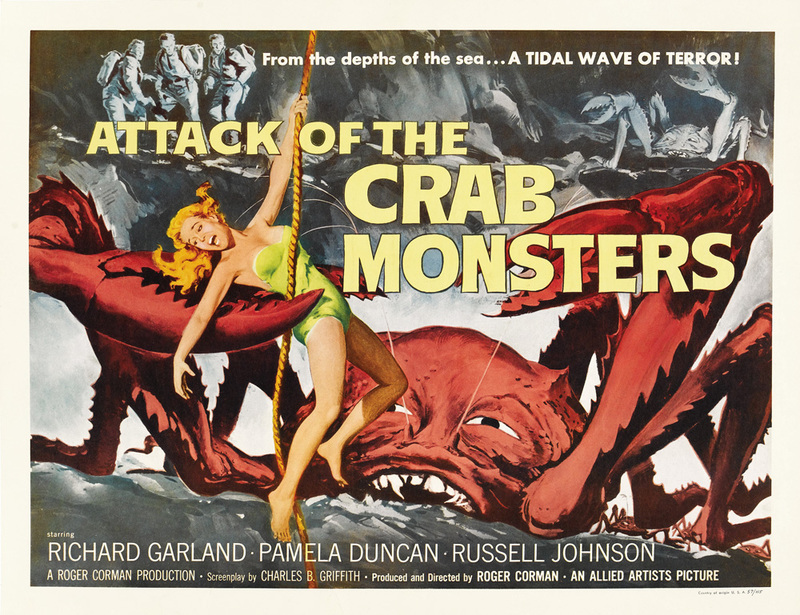 The musical score for Attack of the Crab Monsters was provided by Ronald Stein, who composed music for other Roger Corman flicks like The Terror, Attack of the 50 Foot Woman, and Francis Ford Coppolla’s debut film, Dementia 13. The cast of Attack of the Crab Monsters included Ed Nelson (A Bucket of Blood), Richard Garland (Mutiny in Outer Space), Beach Dickerson (The Trip, Creature From The Haunted Sea), Richard Cutting (South Pacific), Mel Welles (The Little Shop Of Horrors), Leslie Bradley (The Conqueror), and Russell Johnson (Gilligan’s Island). The plot of Attack of the Crab Monsters follows a group of scientists who are researching into the after effects of the Bikini Atoll nuclear tests on local wildlife. To their shock, they discover that a couple of ornery giant crabs that have mutated dramatically, to the point of acquiring telepathic powers. The eponymous crab monsters were portrayed via a two-person suit, with one person filling the body and another operating the claws. Instead of having designated effects workers to operate the effects, actors who weren’t in the specific scene were assigned to run the crab. Attack of the Crab Monsters initially released on a drive-in double bill with Not of This Earth, another Roger Corman directed creature feature from 1957. 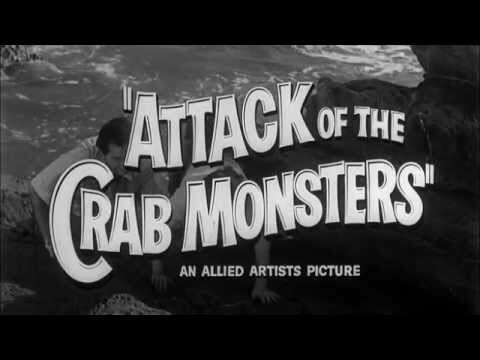 Attack of the Crab Monsters is one of the most iconic of the Roger Corman monster movies, and has appeared in the background of many other films as a form of homage. For instance, sharp eyes might spot the poster or clips of the film in movies like Chopping Mall or Found. Writer/producer Charles Griffith directed all of the underwater sequences in the movie, supposedly because he was inspired by documentary filming done by Jacques Cousteau. Jim Wynorski, a cohort of Roger Corman’s who has directed such flicks as Chopping Mall, Piranhaconda, and 976-EVIL II, has expressed interest in helming a remake of Attack of the Crab Monsters. However, Corman is reportedly against the idea, despite Wynorski having previously remade a number of his other movies, most notably Not of This Earth and The Wasp Woman. The reception to Attack of the Crab Monsters wasn’t particularly great at the time, however, it is undoubtedly a classic Roger Corman movie today. It currently holds a 4.8 rating on IMDb, and Rotten Tomatoes scores of 29% (audience) and 67% (critics). In true Corman fashion, it is estimated that the budget for Attack of the Crab Monsters was an astounding $70,000, on which it certainly managed to turn a profit. Attack of the Crab Monsters certainly doesn’t waste any time getting started: before any character names are even introduced, a crab is on screen and decapitating an extra. This is particularly interesting, given how slowly paced many of these older monster flicks are (The Horror of Party Beach comes to mind). As mentioned previously, this constant action was part of Corman’s plan for the film from the onset, which pays off pretty well for what this movie is. The downside of this, however, is that the audience isn’t given any time to relate to the cast of characters, because they aren’t given any breathing room to be human, and die off quicker than you can get through ice breakers. The plot of Attack of the Crab Monsters could be accurately described as infamously outlandish. 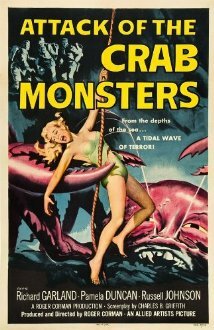 The premise that irradiated crabs with superhuman intelligence and telepathic powers are looking to conquer the world is a few steps beyond the mere bizarre, even for a 1950s b-movie. The fact that the crabs actually have dialogue puts this flick in a league of its own if you ask me. The underwater footage in the movie actually looks pretty good, and if the claim from writer Charles Griffith is true, I’m actually pretty impressed that the production actually did it themselves. Underwater sequences seem to beg for stock footage, and I wouldn’t have put it past them to use whatever was laying around or handy to plug the hole in the movie. There is something particularly appropriate about the movie interrupting and cutting off the character’s final thoughts, like it was trying to hurry people out the door and didn’t actually care what the actors had to say about the situation anyway. The entire movie clocks in at barely over an hour, and shuffles its way quickly through that entire run time. I’m willing to bet that the aim was to get the film to an even 60 minutes, but the team just barely missed the mark. Still, it is almost refreshing to see a movie that races too fast from beginning to end, especially given how many slow movies I have had to sit through. 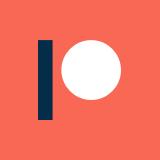 It doesn’t make the movie good (pacing that is too fast is still a problem), but it is certainly harder for me to complain about. Overall, Attack of the Crab Monsters is a rightfully legendary b-movie. You can’t help but giggle when a goofy giant crab claw materializes from off screen without the character seeing it, or when a giant crustacean sets up an elaborate plot by mimicking human speech patterns, throwing its voice, and sabotaging complex communications equipment. The fact that the film takes itself seriously at all is astounding, particularly with the crabs roaring like pissed off gorillas for half of the movie, and speaking in German accents for the other half. The sheer wackiness of the story elevates the feature over a lot of similar flicks from the era without any doubt. It still holds onto the expected bad acting and goofy effects that are hallmarks of the genre, but having nefarious, psychic sea-life hanging about puts Attack of the Crab Monsters a rank or two above its peers in the realm of entertainment value. If you are looking for a b-movie classic to check out, this should be on your list.